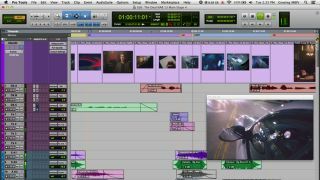 Pro Tools 11 includes new audio and video engines. MUSIKMESSE 2013: Avid has revealed details of Pro Tools 11, the latest update to its industry-standing recording software. Rather than fill it with whiz-bang new features the company appears to have focused on adding functionality that will please existing users. Top of the bill is a new audio engine that offers 64-bit support and is said to enable you to work with many more virtual instruments and effects than before. Also implemented is speedier bouncing of final mixes and new metering options for Pro Tools HD users. You can also work directly with HD video. More details as we get them; you can find out what Avid has to say about the Pro Tools 11 update below. Get multiple times the processing power of Pro Tools 10 to work with way more virtual instruments and effects plug-ins than ever before. And with the new 64-bit architecture, you gain the performance you need to handle the most sophisticated sessions - with more memory headroom to go even bigger. Forget the wait - speed up your final mix delivery with new faster-than-real-time bounce capabilities. New built-in metering standards provide a variety of scale and ballistics options, so you can be assured that you're creating the best mix possible.